Last time I toyed with the idea of “reverse mashing”, I found that an unheated kitchen isn’t a great place to do mashing experiments in the winter. Fortunately, I have a new toy available in the form of an oven with a “Warm” (170°F – 77°C) setting, and so I was able to perform two additional mashes utilizing longer rests. For details on how the experiment was conducted, refer to the first post on the subject. Once again, the reverse mash was performed first, to determine the overall length of both mashes. Total time was 100 minutes, and the temperature profiles for all four mashes are shown below. All other variables were kept constant between the two sets of mashes, with the exceptions of size and fermentation temperature. Since I needed starter wort for some upcoming brewing, I doubled the size of the mashes, to 1000 g of grain each. Fermentation took place in my new fermentation chamber, with the air temperature set for 20°C ± 1°C. The test worts were allowed to ferment for six days, then rested for one day at 8°C before gravity readings were taken. The reverse mash fermented from 12.0°P to 1.0093 SG, and the control from 12.4°P to 1.0068. As expected, the conventional step mash exhibited both higher efficiency and higher attenuation than the reverse mash. While the efficiency values for both new mashes are significantly improved, however, the attenuation values are similar. While increasing mash efficiency is desirable in most situations, home brewers may well find that a very short step mash provides fermentability on par with a more conventional longer mash, and that the time savings outweigh their comparatively modest financial investment. In a commercial brewing setting, however, the traditional lengthy mash with α- and β-amylase rests is clearly the better option. During the reverse mash, did you just mash in and then leave it in the oven set to 170 degrees? If this is the case, then I’m surprised by two features of your data – there are no oscillations from the oven cycling on and off, and rather than the oven bringing the mash into equilibrium at 170, the mash continues to drop in temperature. I’ve seen other home brewers mention putting a BIAB kettle into the oven, but concern about these two factors have kept me away from the idea. I wouldn’t worry about the oven cycling. As long as it’s controlling the air temperature, the mash is going to stay within a much narrower window. As far as setting the oven above mash temp, the two solutions I came up with were to leave the oven on, but with the door cracked; and to wait for the oven to come up to temp, then turn it off and let it cool down over the course of the mash. I know I tried both, and I think the second was what I did for the actual trial, but it’s been so long I’m not entirely sure. Very interesting stuff, thanks for publishing! I’ve always wondered if a reverse mash like this would make more sense for the enzymes to “chop up the long carbon chains” first and then “nibble at the ends” second. (Hopefully this Papazian era understanding of the process is accurate enough). Your experiment seems to show that the step mash really provides more efficiency and attenuability! 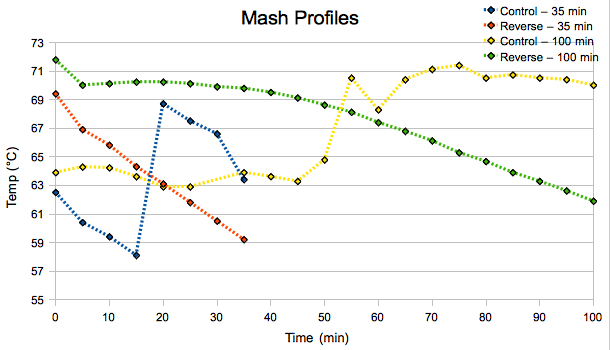 I was also semi-surprised to see the longer mash provide so much more efficiency. Lately I am working across styles with a mash step process of 148F for 40min and then 155 for 20 min. Have you read anything to suggest how the length of time at each temperature may affect the outcome? Is there reason to believe I should be mashing longer or is it not worth the time investment? What If I split the steps up 30-30? Thoughts?